In Fretboard Theory Volume II Chapter 8 you are going to learn how to use CAGED arpeggio patterns to target chord tones while using pentatonic lead patterns. Specifically, you will target the root, third and fifth of each chord as you work through a progression. 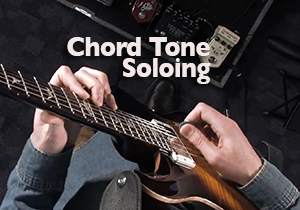 Targeting chord tones helps you to connect scales more closely to their related chords, as well as outline a particular chord progression. You will intentionally be emphasizing each note of the chord, creating a lead line that relates to the music. This approach is sometimes better than just randomly playing scales through a set of changes. You can apply this outlining technique to improvising, as well as to composing guitar solos, riffs, melodies and bass lines. I live down here in Cairns, Australia. 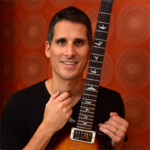 I just wanted to thank you for the great resources that are your podcast as well as Fretboard Theory. I’ve been noodling around on the guitar for donkey’s years and knew lots of chords and scales etc but never really understood how they all fit together. Through working my way through Fretboard Theory and listening to your podcasts so many things have just clicked. I know understand how to play thirds, use the CAGED system and matching it with Pentatonic chords and so many other little tricks I’ve picked up since I bought the book. Anyway, I’m still not very fast or making fantastic music but I just wanted to say thank you for all your hard work in putting these resources together and how much I appreciate them. cheers and hopefully I’ll move on to Fretboard Theory II one of these ol’ days!